“Today is a good day to die.” I thought to myself. But in reality I wasn’t ready to leave this world. Pushing back the tears, I tried to focus on my game of Candy Crush. I clutched my phone, trying to slide the little multi-colored sugary sweets, back and forth, to reach the next level of the game. Somehow though, this diversion wasn’t working. The tiny screen turned blurry, my stomach tightened, and I started to sweat. I put the phone in the magazine pocket in front of me. Locating the emergency procedures card, I placed it where I could reach it easily, just in case. I sat on my hands and tried to evaluate the level of danger. The paneling in the ceiling was still in place. The wings outside the window seemed rigid as they reflected the dull pink of the late afternoon sun. Yet everything inside the plane seemed to be in frantic motion. The more I fly the worse my anxiety seems to get. My rational mind says that the plane isn’t going to crash, but something just seems to take over my body when the fuselage starts to shake. I can’t stop my brain from imagining the spiraling motion as I fall from the heavens to my death. I have tried everything: deep breathing, self-hypnosis, alcohol. And they won’t even let you smoke anymore. 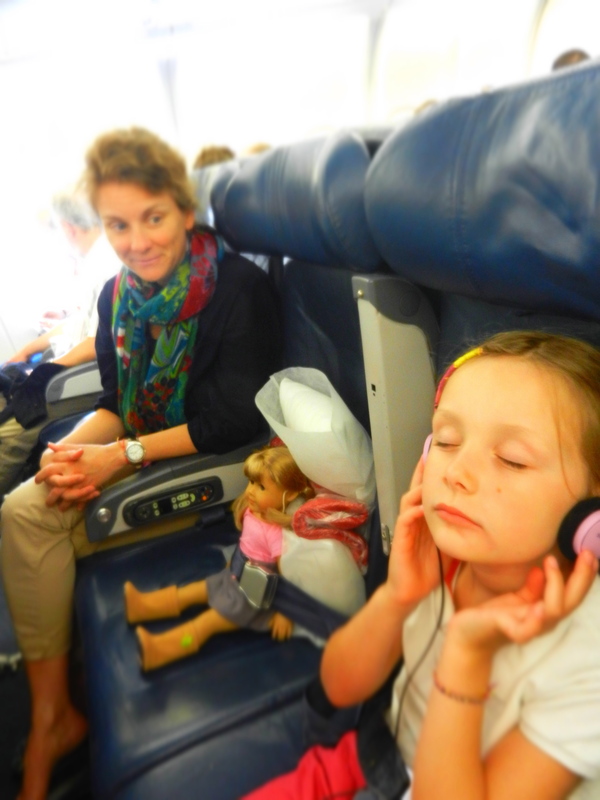 The child and the doll are calm and unaware of the dangers. I’m trying to stay calm in the midst of the horror. Nothing seems to help me in these moments of extreme terror and turbulence. I have even tried to watch a good movie, to lose myself in the fantasy world. Whether it is Bridgit Jones, Blades of Glory, or Bond, I can’t seem to enjoy a film. The more intense the movie, the more intense my panic attack becomes. In reality, I don’t think I have ever been on a flight that was seriously in danger of crashing. Last Christmas traveling from Atlanta to Stuttgart, the turbulence was so bad that for 3 hours the passengers and flight attendants were asked to remain belted in their seats. Two years ago my plane from London to Stuttgart was trying to land during a monstrous thunderstorm. Unable to land as lightning crashed right next to the wings, the plane ran low on fuel. Eventually we were able to make an emergency landing in an out-of-the-way airport near the Bodensee. Last week’s 45-minute ride from Berlin to Frankfurt had minimal turbulence, but I think it was the worst anxiety I have experienced to date. The flight attendants were still passing out drinks with smiles on their faces as I was reading myself my last rites. According to an article from Popular Mechanics, there has only been one time in history where a plane went down due to turbulence. Some would say this statistic is no longer relevant because the design of the plane from 1966 is now obsolete. Today’s planes are built to withstand incredible pressure and force. A Boeing 777’s wings have been tested to withstand 154% more pressure than its designed limit load. See for yourself the huge amount of flex in the wings before they snap. And in most cases, when planes feel like they are jumping up and down, they are really losing very little altitude. I know that I can’t just stay on the ground the rest of my life. The road is more dangerous than the air. According to a 2013 World Health Organization report, “approximately 1.24 million people die every year on the world’s roads, and another 20 to 50 million sustain non-fatal injuries as a result of road traffic crashes.” What is the statistic for average deaths in the air? Based on 20 years of data collected by OAG Aviation, my odds of being in a fatal plane accident if I fly with one of the top 39 airlines, is 1 in 19.8 million! What am I so scared about? Maybe it is the lack of control. I have no idea what is going on in the cockpit when I’m strapped into my tiny uncomfortable plane seat. Or maybe it is the speed (or lack of it) of the oncoming crash that I fear most. In a car, I could get slammed from the side and never see my death coming. But on a plane, I would be fully conscious and aware of the danger. I would feel it coming. I would have to wait, knowing that in a few minutes, it would be all over. I fly twice a year over the Atlantic, and numerous times a year to places around Western Europe for work and vacation. I dread it. When I wake in the night, days before my flight, I slip into fits of anxiety that leave me in cold sweats worrying about falling out of the sky. Will this be the trip where I become this evening’s news flash? And yet, by some miracle, I always survive the flight with some story tell about the best flight attendant ever, a cool person I met while waiting for the flight, or the spectacular view of the sea and land from 30,000 feet up. Yes, today was a good day to fly. How do you stay calm when the ride gets bumpy? Do you have a horror story about flying? I also am not a huge fan of flying, but I find a cocktail or two does take the edge off. I also have a Xanax on hand, just in case. I’ve never had to take it, but just knowing I have it helps. I’ve only been on one flight where I thought it might not end well, but no one else seemed to be overly concerned about the noise and shaking. 😉 Looking forward to your next trip across the Atlantic. I tried having a few glasses of wine once….major dehydration headache. Usually by hour 6 or 7 my mind settles in for the long haul. Good flight attendants help too. This one guy on the Delta Amsterdam-Seattle run always makes my day. Red head with glass, this guy makes duck noises for the crying babies, calms the bitching customers who are angry they didn’t get an aisle seat, and gives me as many ibu as I need. When I see him on my flight, I know all will be well. I’m with Chris. I (prepare to) medicate. I fly every month overseas so now I take a lot in stride, but sometimes I’ll wake in a sweat during turbulence convinced we’re going to crash into the ocean. What is that inside our brains though that makes us worry so? It didn’t worry me so much before. Usually short flights over land don’t bother me. My thought is…more chances of finding an airport for emergency landings. Is it the same if you fly alone? I am more stressed about it when I am with my family. I don’t want anything to happen to them and I sure don’t want our last moments to be terrified ones. Yes! When flying with the girl I worry about staying calm in the face of danger. I decided to take flying lessons to learn exactly how it all works and whether all that anxiety is really necessary. It did the trick and now I have zero problem with turbulence. Once you experience turbulence in a Cessna 172 and realize what it would take for disaster to strike, it becomes clear that it is exceedingly unlikely to die in a place crash. So, save up some cash and find some time. And besides, you will have a pilot’s license at the end of the process. Cool! Cyrus, this sounds intriguing. When you are in the driver’s seat I’m sure it makes a world of difference. The recent loss of MH370 makes this all too real. Funny you should mention this. I turned on CNNWorld for 10 minutes of catching up. The show that was on did a feature on why there is more intense turbulence/global warming. It showed crazy video of some rocky rides. I got up to go to the bathroom, came back and a reporter was breaking the news about the Malaysian flight. I will still fly, just not over air space where they are fighting a war.